Asking just $14.00 -- MUST SELL -- Make me an Offer !! Buyer to pay U.S. Shipping, or items can be picked up. Cash or Money Order only. 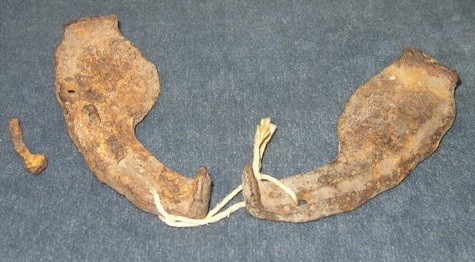 Rare, Pair of Antique Oxen Shoes, 1 nail is removable. A Unique Item to add to any Collection -- OR just for Display for a Great Conversation piece !! Each Shoe measures 4-1/4 x 1-3/4 inches. See Antique Tools, & Kitchenware, & ALL my items posted for sale in my online store !